There’s a reassurance in being part of a church body and all the services that body offers. We share a focus, we share some like beliefs, we meet together and sometimes we even share our innermost thoughts. Church is a spot dedicated to “family” intimacy but learning obedience to our faith with that kind of intimacy is hard. It’s not purposely hidden but in my experience it doesn’t happen frequently either. 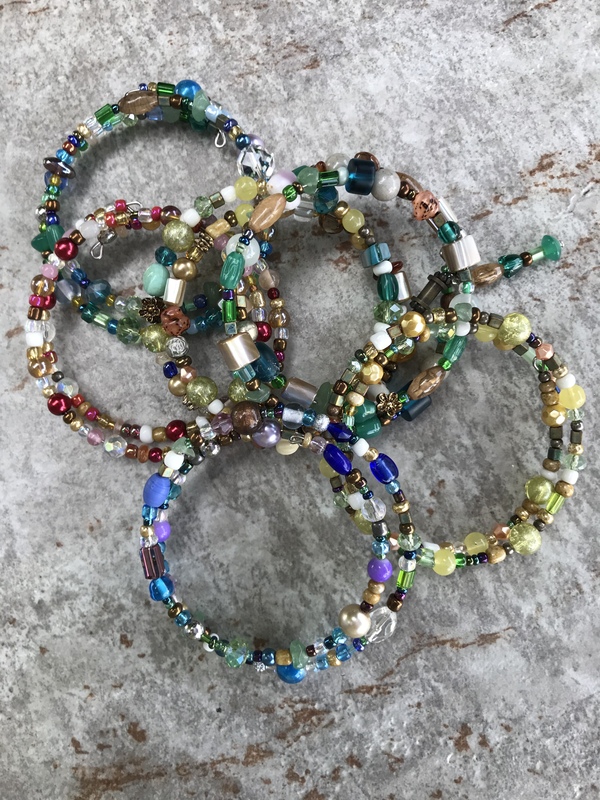 I’ve been making these beaded memory wire bracelets for the Operation Christmas Child boxes our church will pack in November. They’re so pretty I decided to wear one to church last week. In an inspired moment I gave the bracelet I was wearing to a woman I know almost nothing about except she is a sister in Christ. I wanted her to know, and believe, I understood that about her. It made perfect sense to me to remove it from my arm right there in the church pew and place it on hers with a hug and the phrase “we’re a circle of sisters.” At that moment a simple piece of coiled memory wire with a lot of different beads became an object lesson for me. Memory wire is interesting because no matter how many times you test it by uncoiling it to put it on or take it off it remembers the shape it was created in. That’s both the basis and the beginning of my object lesson. Memory wire is like the image of God created in us. It’s a shape we may forget but God remembers. We are the beads. The beads are only accents that make the bracelet a visible and beautiful reminder of that remembered shape. I hope that woman will wear her bracelet and let it prompt her memory: God remembers his image in her and so do I…AND….she’s a beautiful “bead” in the circle of sisters. I’ll probably never see any of the girls who’ll receive one of these bracelets next winter but my heart is filled with that same hope for them. I know God remembers his image in each of them. My hope is that bracelet wrapped around their arm may help them remember too. Posted in Object Lesson, Remember? Colossians 3:22 Slaves, obey your earthly masters in everything; and do it, not only when their eye is on you and to curry their favor, but with sincerity of heart and reverence for the Lord. 23 Whatever you do, work at it with all your heart, as working for the Lord, not for human masters, 24 since you know that you will receive an inheritance from the Lord as a reward. It is the Lord Christ you are serving. I know my heavenly master but I haven’t paid enough attention to the awareness that while I don’t have a job and a boss, real life is my earthly master. I spend many hours each week in the Word and in thought dedicated to learning to live in this world “with sincerity of heart and reverence for the Lord.” That’s where “Slaves, obey your earthly masters in everything; and do it, not only when their eye is on you” comes into play for me. I struggle to string together a coherent prayer built on God’s perspective for the dismal realities of that earthly master. Those are situations so far removed from my own life; serious world situations and leaders that I have absolutely no control over. I’m startled by the realization that I’ve let what I work at with all my heart, my dedicated preparation to know my heavenly master, insulate my mind from the only possible option I have to obey that earthly master. It’s a revelation for me to accept the only frame of reference I have for those dismal situations I can’t control is prayer. May that new “sincerity of heart” continue to be so! Colossians 3:12 Therefore, as God’s chosen people, holy and dearly loved, clothe yourselves with compassion, kindness, humility, gentleness and patience. 13 Bear with each other and forgive one another if any of you has a grievance against someone. Forgive as the Lord forgave you. 14 And over all these virtues put on love, which binds them all together in perfect unity. 15 Let the peace of Christ rule in your hearts, since as members of one body you were called to peace. And be thankful. 16 Let the message of Christ dwell among you richly as you teach and admonish one another with all wisdom through psalms, hymns, and songs from the Spirit, singing to God with gratitude in your hearts. 17 And whatever you do, whether in word or deed, do it all in the name of the Lord Jesus, giving thanks to God the Father through him. I’m a list-maker so lists in Scripture always catch my eye. The thing about lists is they serve a necessary purpose in daily life. They’re usually filled with things to do and the object is twofold; to be reminded and to be able to √ items off. That’s how lists work. I think Paul’s √ list of virtues works the same way. It’s both a to-do and a reminder list but it has an added benefit. Paul’s reminders are the right response to being “God’s chosen people, holy and dearly loved” but they’re about more than behavior. What if there’s another purpose to those reminders – the training of the heart? What if each thing on that list of virtues is also a ? to ask yourself that applies to “whatever you do, whether in word or deed?” What if the answer to each ? is as important as being able to √ it off? • Compassion? • kindness? • humility? •gentleness? • forgiveness? • love? Colossians 3:1 Since, then, you have been raised with Christ, set your hearts on things above, where Christ is, seated at the right hand of God. 2 Set your minds on things above, not on earthly things. 3 For you died, and your life is now hidden with Christ in God. 4 When Christ, who is your life, appears, then you also will appear with him in glory. 5 Put to death, therefore, whatever belongs to your earthly nature: sexual immorality, impurity, lust, evil desires and greed, which is idolatry. 6 Because of these, the wrath of God is coming. 7 You used to walk in these ways, in the life you once lived. 8 But now you must also rid yourselves of all such things as these: anger, rage, malice, slander, and filthy language from your lips. 9 Do not lie to each other, since you have taken off your old self with its practices 10 and have put on the new self, which is being renewed in knowledge in the image of its Creator. 9…you have taken off your old self with its practices 10 and have put on the new self, which is being renewed in knowledge in the image of its Creator. Those sins are now hidden. You’re forgiven! Thank God for that, but you may have some scars. Jesus has a purpose for your scars, just as he did for his own when he showed them to Thomas, the doubter, as proof of new life. Remember those scars? Remember whose image is renewing you?